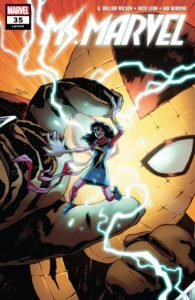 It’s the thrilling conclusion of Ms. Marvel’s battle against The Shocker as both Kamala and Bruno are forced to fend off not only the villain but also the spinning forces of destiny. All from the creative team of G Willow Wilson, Nico Leon and Ian Herring. The Shocker has spent most of his costumed career as a low grade goon, a periodic pest to the likes of Spider-Man. He has never managed to rise above this station, make it to the level of arch nemesis, a true super villain. Well, he’s sick of it and has trudged across the Hudson to Jersey City with eyes to redefine himself and accomplish his dreams of becoming a better bad guy. The Shocker’s relative ineptitude as a costumed cad notwithstanding, he is something of a brilliant inventor. Hoping to build a doomsday device to allow him to fulfill his dreams, The Shocker accidentally created a temporal vortex, a wormhole in time and space that connects to the multiverse. 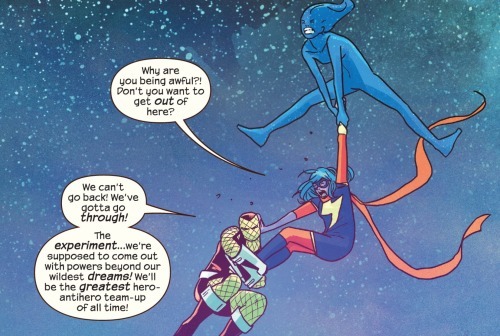 And doing so has played havoc on Kamala’s Inhuman powers, making it incredibly difficult for her to control her ability to stretch, shrink and embiggon. At first, Kamala and Bruno believed that her sudden inability to control her powers had something to do with experiments they’d conducted to try to understand the nature and upper limit of these powers. Through it all, Bruno has been able to figure out how Kamala’s powers work, how she is able to increase and decrease her mass without affecting volume. 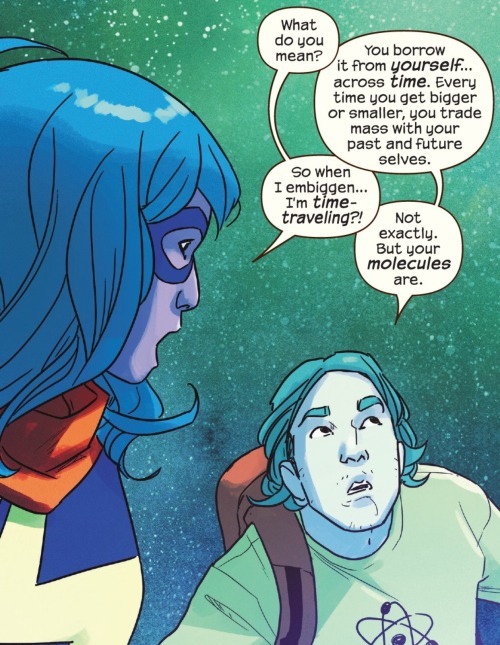 It turns out that Kamala’s mass-altering abilities is all about borrowing and depositing tiny amounts of mass across a countless number of her future selves across the multiverse. Well, that answers that… but Kamala and Bruno still have to deal with The Shocker and shut down his experiment. After a quick jaunt through the membrane of the multiverse, the two pop back into their own reality ready for action. 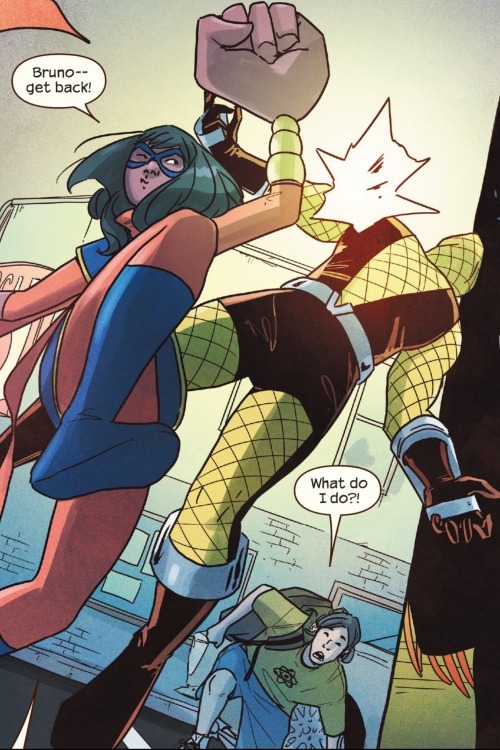 Ms. Marvel gets to super-heroing up The Shocker while Bruno dashes to the source of the vortex so to somehow turn it off. Bruno follows the vortex back to its source, discovering The Shocker’s odd, cobbled-together base. The device that had created this vortex has been left on for too long and is now creating a rapidly growing Einstein–Rosen bridge rift in time and space. It is spinning out of control, threatening to grow so large that it could swallow up all of the city. Bruno pushes down his fear and climbs up into the base, searching out the source of the vortex. He finds The Shocker’s device, but struggles to figure out how it might be turned off. He ultimately realizes that the vortex might be un-made by causing conflicting forces to negate one another. There’s a lot of comic book style science here that I’m not even going to pretend I can understand. Suffice to say, Bruno is able to arrange these negating forces and they do indeed cancel out the vortex, shutting the device off. 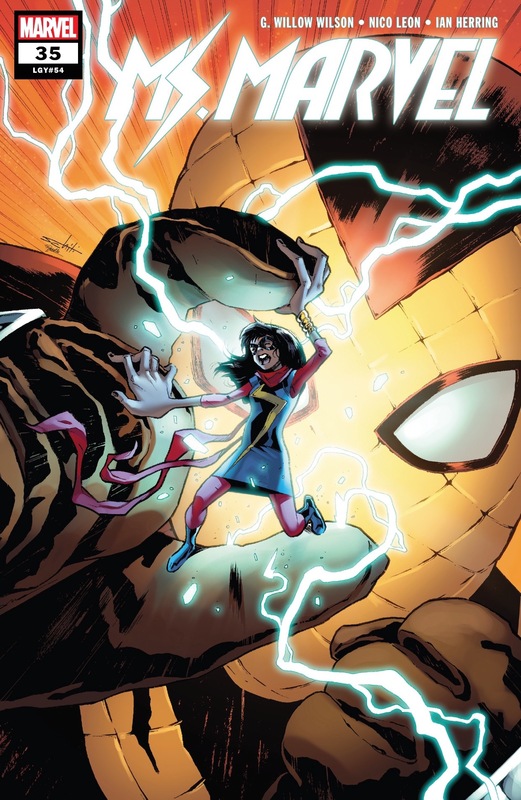 Meanwhile, Ms. Marvel and The Shocker continue their battle. 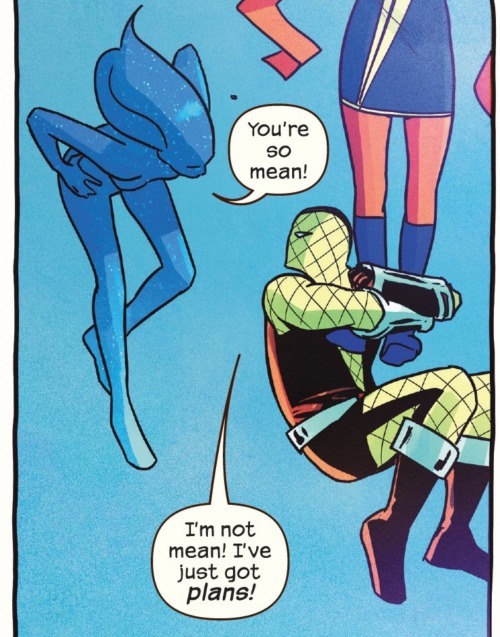 The Shocker attempts to rile up Ms. Marvel with typical bad guy banter about how she is just a puppet, a cog in the machine maintaining the status quo. 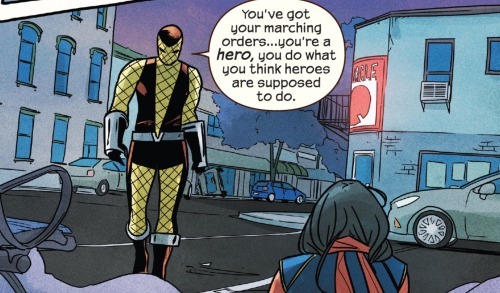 The Shocker sees himself as a middle of the road bad guy and Ms. Marvel as a middle of the road good guy; he argues that the only way to break into the big leagues is to break the rules, defy what other expect and seize hold of one’s own destiny. His villainous ambitions aside, The Shocker’s desire for self-improvement is kind of admirable. Unfortunately for him, he ends up caught up in the chaos he had unleashed as both he and Ms. Marvel find themselves sucked back into that limbo space between dimensions. 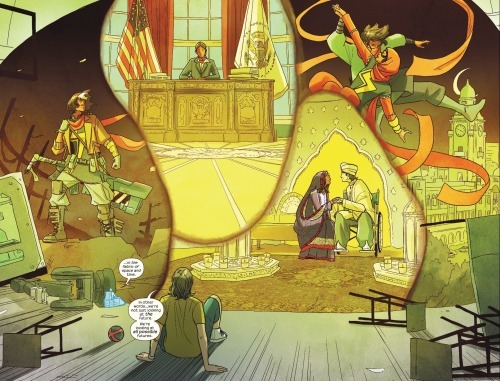 This is the realm of Singularity, the playful and benevolent being Ms. Marvel had encountered in the previous issue. Singularity attempts to once more assist Ms. Marvel, yet she can sense that the wormhole is about to close. Bruno’s actions to cancel out the vortex is about to succeed and Ms. Marvel needs to exit through this doorway before it closes or else risk bing lost forever in this realm between realms. Yet the Shocker doesn’t want to be rescued. 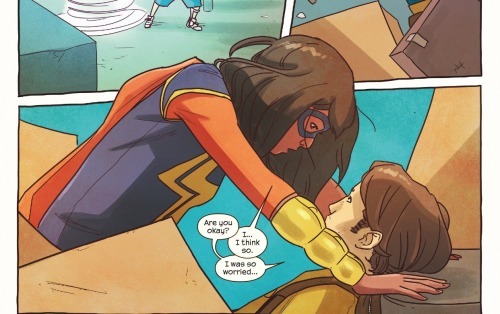 He refuses to let go of the notion that this is his path toward greater things; and refuses to let go of Ms. Marvel. Well, Ms. M is absolutely at the end of her rope with The Shocker and gives him the boot… kicking him off of her and sending him careering off to who knows where. 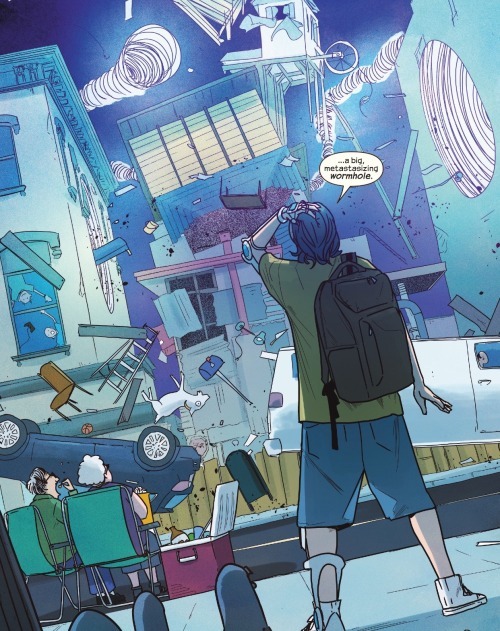 Singularity brings Ms. Marvel to her home dimension just as Bruno succeeds in turning off the device. The crisis is averted, the villain has been defeated; the day is saved. Some time later, a new vortex opens up for a quick moment in Brooklyn… just long enough to deposit The Shocker into a trash dumpster. And it just so happens that Spider-Man is hanging out right there, very much ready to web up the villain and hand him over to the authorities. 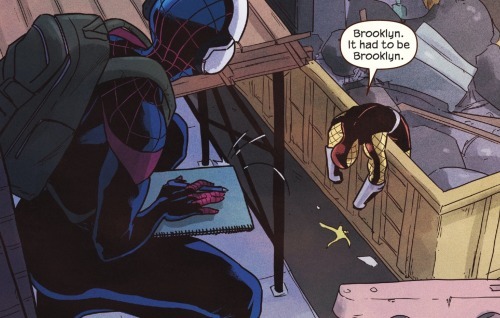 A thoroughly defeated Shocker sees that he’s in Brooklyn, sees Spider-Man, and realizes the entirety of his defeat. Back in Jersey City, Kamala and Bruno find one another. They’re both exhausted, both rather overwhelmed by all that has happened and all of the feelings it has churned up in them. Yet both have done enough for the day… they’ll deal with it all, but not today. Instead they go get gyro sandwiches. And it is here that the story comes to an end. This was the first story arc that Wilson and company has offered up since the commemoration of Ms. Marvel’s fiftieth issue. And if this adventure provides any indication, it looks as though the second fifty issues of Ms. Marvel are going to be just as great as the first fifty. Just like the vortex at the center of this story, there is a whole lot of stuff that spins about the tale. There is the discovery and explanation of Kamala’s super powers; the mixed up feelings Kamala and Bruno have for each other; Bruno’s contending with his past injuries and the looming worry that it will result in his being remanded to a wheelchair; the threat posed by The Shocker; the sense of pressure Kamala feels toward living up to both her own and her family’s expectations; as well as further breadcrumbs regarding the mystery of Kamala’s lineage… All of these components spin about wildly throughout the course of the story and somehow Wilson and company get it all to land like puzzle pieces that come together on their own. It is just super impressive. The Shocker’s hammy attempt at villainous banter helps to underline the central theme of coping with one’s fate without feeling powerless to one’s destiny. Yes, I realize that may seem like a stupid sentence, but fate and destiny are not completely interchange words. ‘Fate’ is what is going to happen; it is out of our control. Whereas ‘destiny’ is what one is meant to do and seizing upon it is in one’s control. It may be Bruno’s fate that he will lose the use of his legs, life in a wheelchair may be something he simply cannot avoid. Yet his destiny of having a happy and fulfilling life despite this handicap is a matter within his control. And it is on him to choose to try to seize this destiny. Bruno got to see a multitude of possible futures for Kamala and he has no way of know which if those futures will come to be as the one in store for them. They may be living in the reality for Kamala becomes president; they may be in the reality where Kamala ends up with The Red Dagger; they may be in the one where Bruno and Kamala get married; they may be in one that wasn’t shown. There’s no way of knowing. Yet that doesn’t mean that Bruno is powerless in the face of destiny. To the contrary, he is going to do whatever he can to seize upon that destiny and try to make the one he most wants come to fruition. And to this extent he is no longer going to push away his feelings. 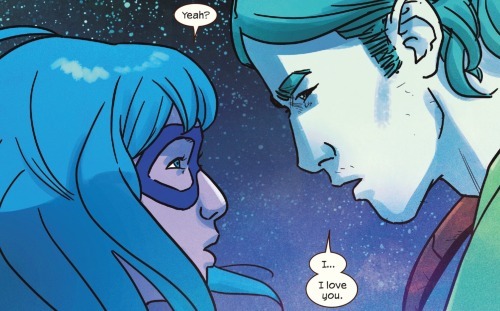 He tells Kamala that he loves her, that he’s in love with her. Whether or not Kamala loves him back remains undermined. Of course she loves Bruno, but doesn’t know if she is in love with him. Her destiny remains a bit more clouded. There are futures in store for her where she may achieve greatness, some where she is burdened with terrible loss; some where she finds happiness and others where she does not. She could become the president or she might become a post-apocalyptic warrior; she might end up with a quiet life being happily married or might end up with a life of action and adventure. The Shocker sees himself as a middle-of-the-road villain and he attempted to buck that fate by reaching for a destiny of greatness. And Kamala is in a similar position. She’s a hero, but she is still young, still lacking in experience. Will she remain a middle-of-the-road hero, or will she attain greatness? Her true fate is unknown and is ultimately out of her hands. And yet how she may try to seize upon a destiny is in her control. To do so, however, entails figuring out what it is she truly wants… which of those multitude of futures is the best fit for her. She doesn’t know yet; it’s something she still needs to figure out. And I’m definitely sticking around to find out. Again, the art and coloring matches the writing flawlessly. Wilson, Leon and Herring achieve a synchronicity that is increasingly rare in mainstream comics these days. Creative teams flux and bounce around so often that writer, artist and colorist don’t get the time to really getting synched up. 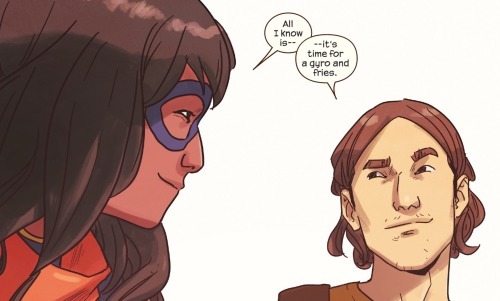 Wilson, Leon and Herring have been making Ms. Marvel comics together for a long while now and it is really paying off… offering a cohesion where the art and words compliment each other and offering a final product that is greater than the sum of its parts. Four out of five Lockjaws for the individual issue and five out of five Lockjaws for the story arc as a whole.